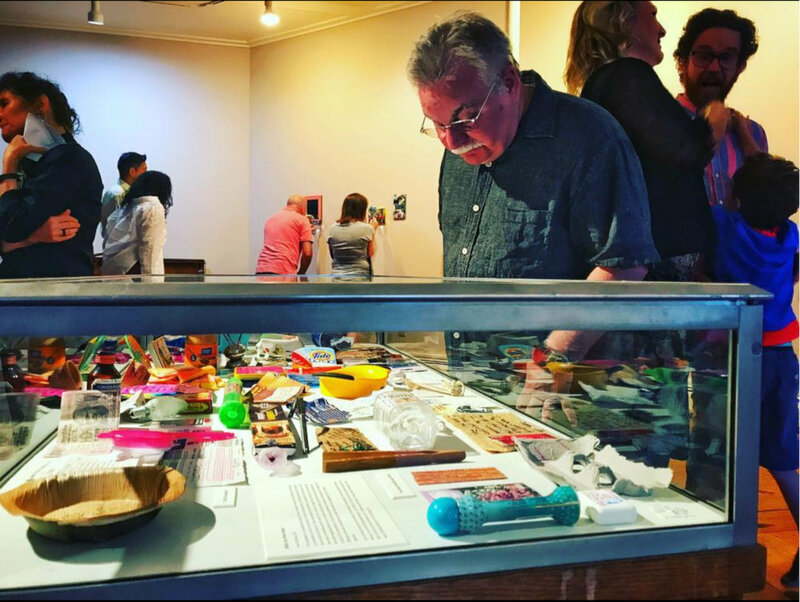 This installation is a collaborative project with an American friend, Emily Griswold, who lives in my hometown in India. Every day for a month we recorded our initial experiences of the place that we had just moved to. These impressions are inscribed on objects that are peculiar to this new place, something we hadn’t seen in our country of origin. By conjuring up the surprise we felt while navigating what is now a familiar cultural terrain, we deconstruct and examine the process of our assimilation. In this manner, we hope to create a consciousness of similarity and difference while also showing how personal narratives act as gateways into the larger collective. Emily Griswold was born and raised in Providence, RI. She has worked with Project Rescue, an anti-trafficking organization from 2009 to 2011 and has since been working with an NGO in Calcutta that provides care for children and families in need, such as education, clean water, feeding programs, safe housings, etc. 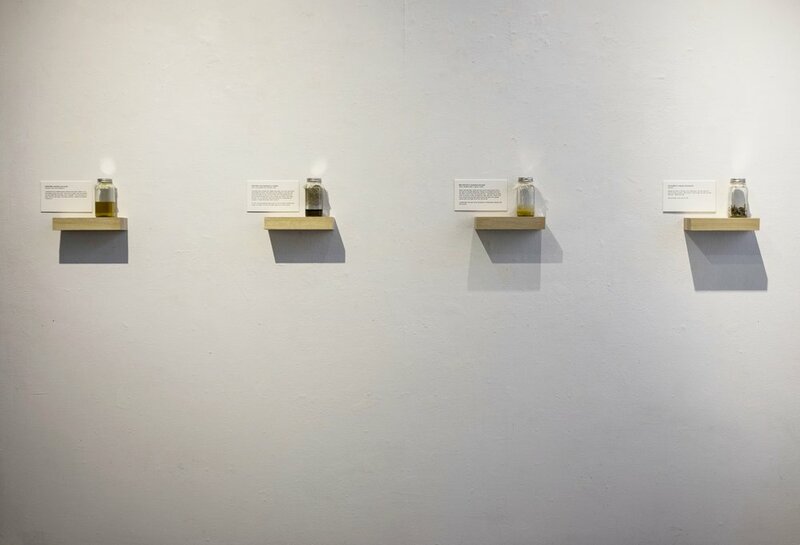 The Humors is an installation comprising bottled smells placed in specific relationship to fragments of autobiographical text. The viewer is invited to open the bottles and partake in smelling its contents. 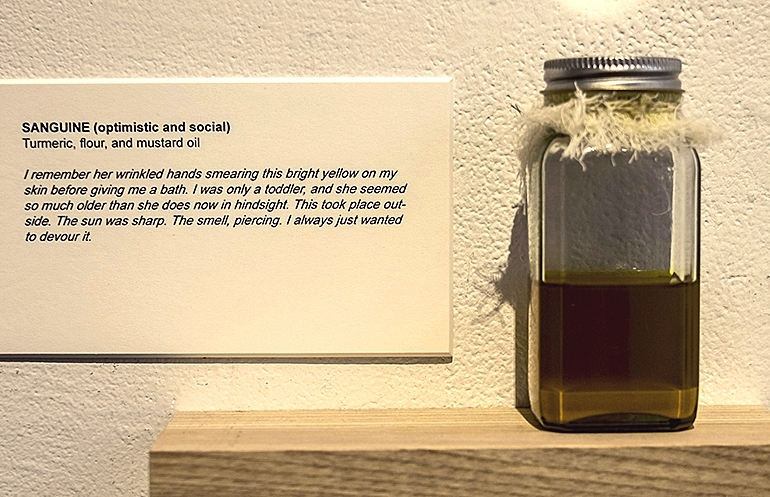 This installation not only explores the intersection of smell and memory but also examines how personal narrative can act as a gateway to the social.